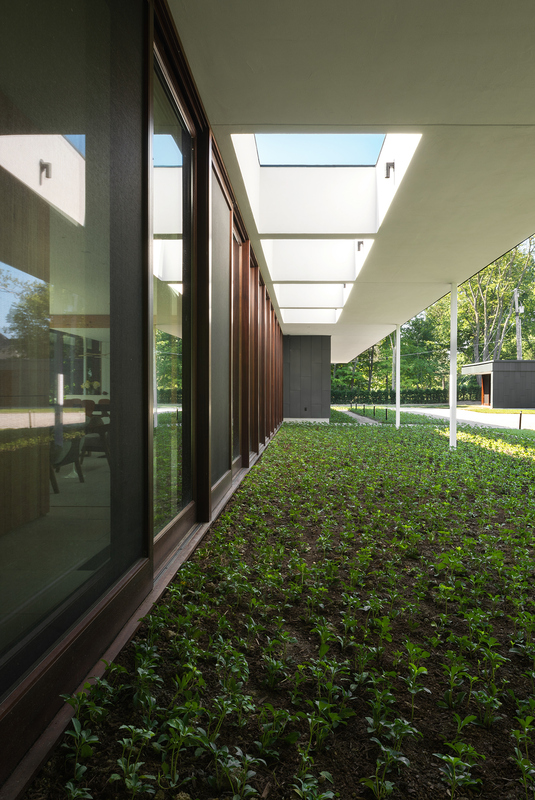 The living areas of this house, located in Indianapolis, Indiana, seem to float between the grassy swells of the ground and the flat, protective roof above. Inspired by the lush, wooded site, the landscape floods into the interiors of the home via expansive windows and sliding glass doors. These views are central to life inside and outside. Living spaces are designed to be comfortable and welcoming, lending a softness and intimacy that enrich the overall experience of living within the home. Zinc panels—each specifically textured to complement its position and access to natural light—and mahogany doors and windows combine with the light gray pavers in a modern yet warm palette of materials. Tones and materials add texture and personality to modern spaces; they also bring intimacy to rooms with breathtaking views. This same careful composition of materials is also evident in the individual selection and composition of the reclaimed heart pine siding that outlines the different interior volumes. 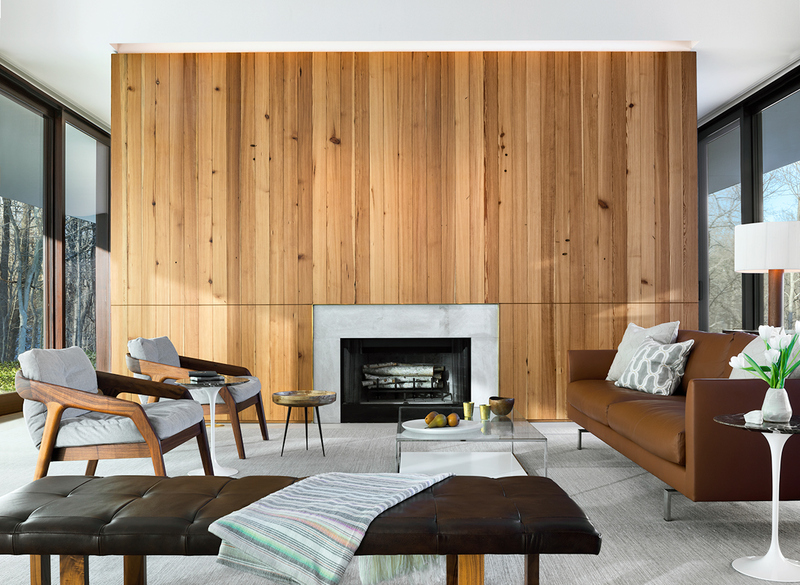 While each individual design element of the house—be it a chair, a textile, stone, or wood material—can stand on its own, they work together to enhance all the possible activities of the home’s residents: evenings by the fire, breakfast with views of the woods, or a quiet moment alone. 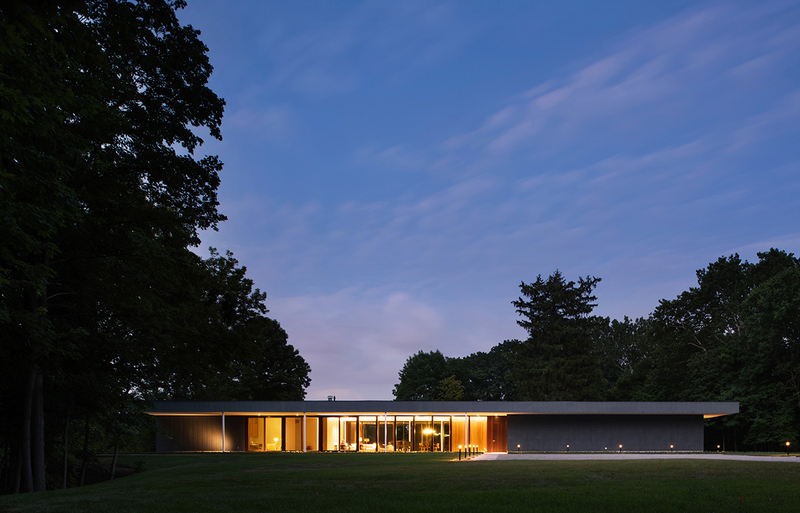 This modern 3,500 square foot house is defined by the juxtaposition of its rectilinear roof and the dramatic topography of the wooded site. 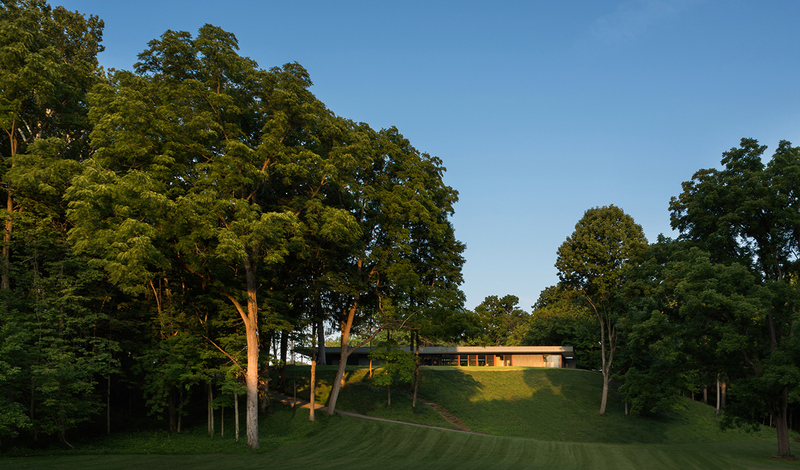 We designed the house on a well-defined plinth of limestone pavers and introduced tall sliding glass doors to create the illusion that the long, flat roof floats over its base. The sliding glass doors also encourage movement and views between the interior and exterior. Zinc panels and mahogany doors and windows combine with the light gray stone pavers in a modern, yet warm palette of materials.